Are you looking for a writing activity working with words? There are many types of educational exercises that can be used to spur creativity or in classroom settings. If you are supplementing your freelance writing income by teaching writing skills to others, these types of activities can be an invaluable resource for you and your students. Whether you're trying to inspire creative writing skills or looking for a way to improve grammar and spelling knowledge, using one or more of these activities can be a great way to accomplish your objectives. If you're looking for a way to help your students get comfortable with the writing process, consider trying a free writing activity. This exercise simply involves setting aside a period of time for writing with no restrictions. Participants should simply place a pen to paper at the beginning of the activity period and write whatever comes into their minds during the allotted period of time without worrying about content, organization, grammar or spelling. The idea behind a free writing activity working with words is simply to get into the mindset of transferring thoughts to paper. Because so many people find that getting started is the most difficult part of the writing process, this exercise can help take away some of the stress that is often associated with a blank piece of paper and a writing assignment. Alternately, you can use a computer for this exercise instead of a pen and paper. Since the idea is to take the stress out of the writing process, it may be best to allow participants to choose whether to use paper or a computer keyboard, assuming that you have access to computers in the place where you will be leading the activity. Journalling is one of the most popular educational writing activities in classroom settings. This type of activity simply involves assigning students to make a certain number of entries into a personal journal each week. Students are generally required to turn in their journals periodically, so that instructors may verify that the assignments were completed and to assess the quality of work. As opposed to free writing, where students are instructed to write whatever comes to mind, journal activities tend to be more structured. Typically, teachers who assign journal writing homework make specific assignments to be completed throughout each week. Common topics might include reflecting on a current news story, applying a lesson learned from a reading assignment to real life, and other reflective activities. A primary objective of this type of assignment is to get students into the habit of writing on a regular basis. Additionally, journalling is designed to encourage students to develop critical thinking skills by engaging in reflective writing, applying what they are studying and experiencing to their own lives on a personal level. One of the best ways to teach students to write sentences that are grammatically correct is to have them participate in a writing activity working with words that involves reviewing pre-written sentences to identify errors and correct them. It's best to provide participants with several sentences of varying lengths and on different topics. Some of the sentences should be correct the way they are written, some should contain common grammatical mistakes, and others should include errors that are more difficult to find. Students should be instructed to mark what is wrong and suggest corrections for the errors they have found. The instructor should provide feedback and guidance during the activity. 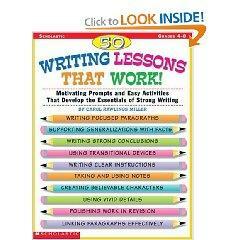 Puzzles designed specifically to develop language arts skills are another type of educational writing activity. If you are trying to teach the parts of speech, for example, consider giving students a crossword puzzle where all of the responses are nouns. You may also want to create search-a-word puzzles where participants must find all of the verbs, or another part of speech. Offer prizes for those who get a certain number of correct responses and you'll likely find this activity to be very engaging. These are just a few examples of writing activities that can be used to teach and reinforce the skills necessary for effective writing as well as help students overcome writer's block and fear of writing. While these types of activities aren't a substitute for structured classroom instruction, they are an excellent tool to enhance learning and engage students, while providing teachers with a way to tell how well students are able to apply and transfer what they are being taught in class.